In 2015 we moved from the Phoenix area to Seattle. It was a big move and we did it ourselves so we sold as much as we could and then had to start over when we got there. 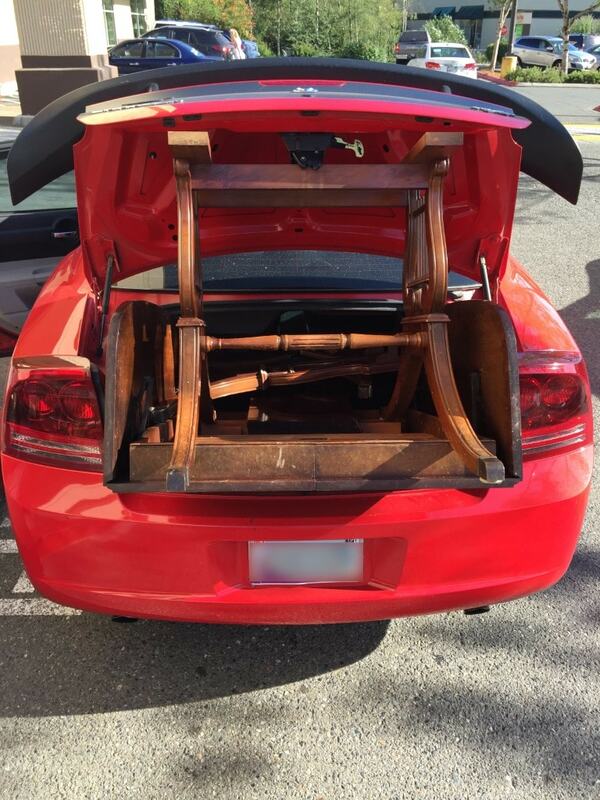 The first thing we needed was a dining room table…so off I went to the local thrift store, Value Village. I fell in love with Value Village the first time I walked through the doors. They always had a ton of furniture and I LOVE OLD FURNITURE!!! 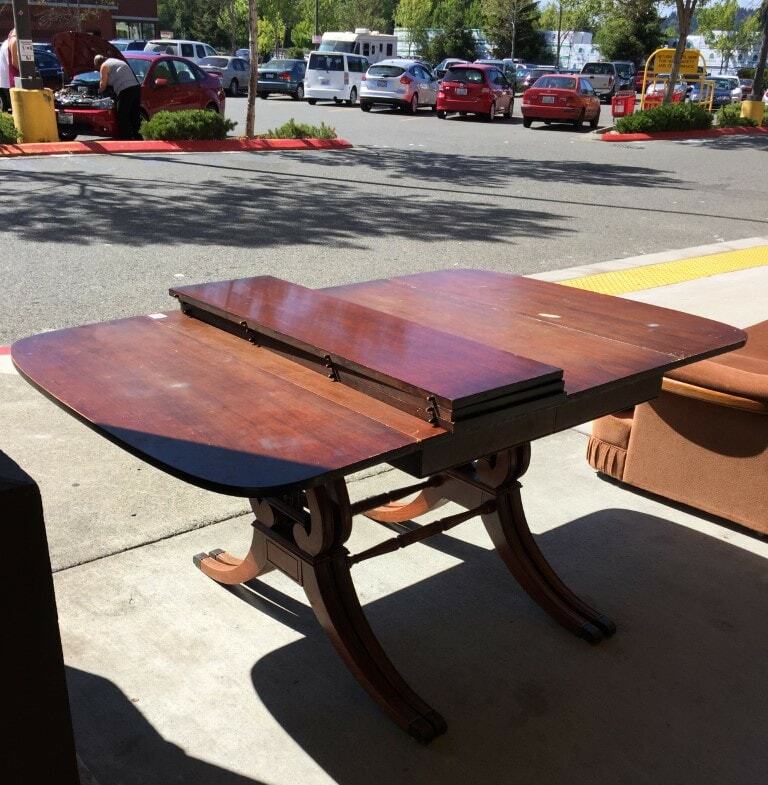 Anyhow…sitting outside was this wonderful drop leaf dining table with the harp style legs and THREE leaves. I loved it as soon as I saw it and I knew right away this would be my first project. 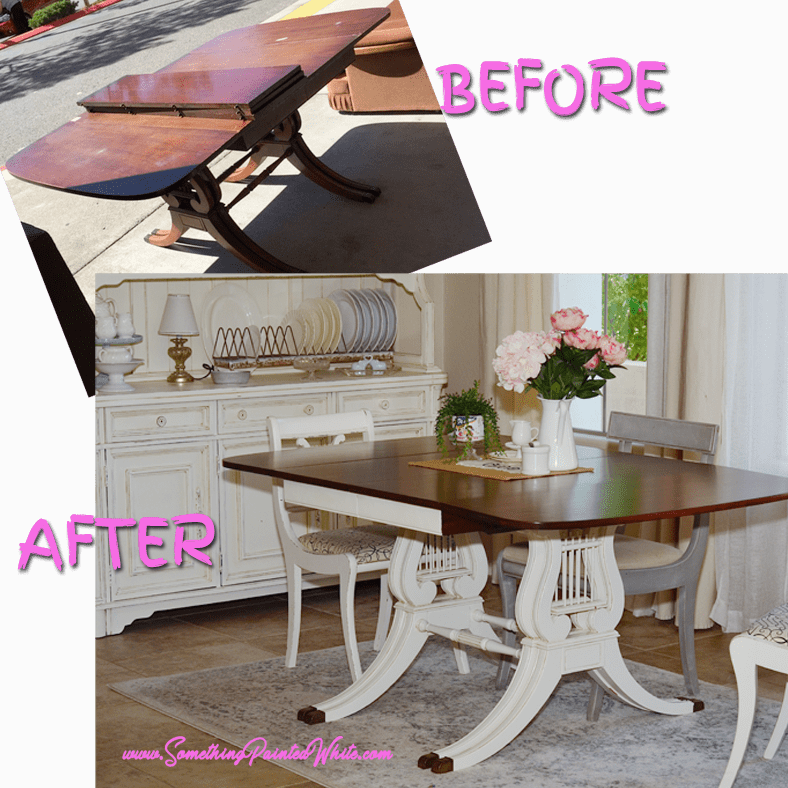 A dining room table makeover. Yay!!! This is how she looked when we first met. Dining Room Table for $25.00, my thrift store WIN! 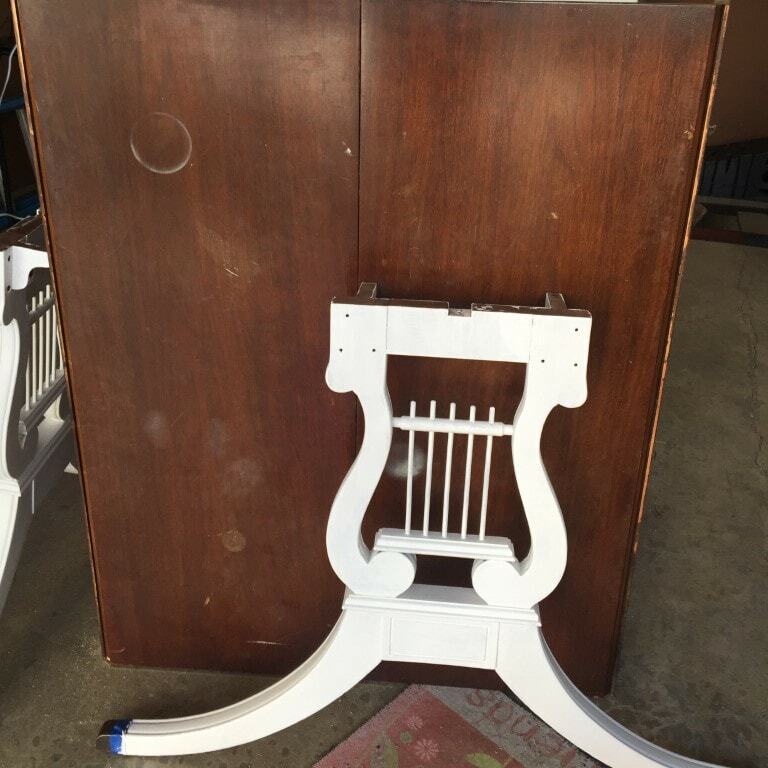 Those curvy harp style legs just sang to me (get it…harp…sang…never mind) anyhow…I couldn’t believe the price….$25.00!!! There was no way I was passing up that sweet deal!!! So the hubs and I bought it, disassembled it, and loaded it into our Dodge Charger (aka, The Racer). That’s right…no truck here…but as I always say, ‘OH, it’ll fit!! !” And it did!!! 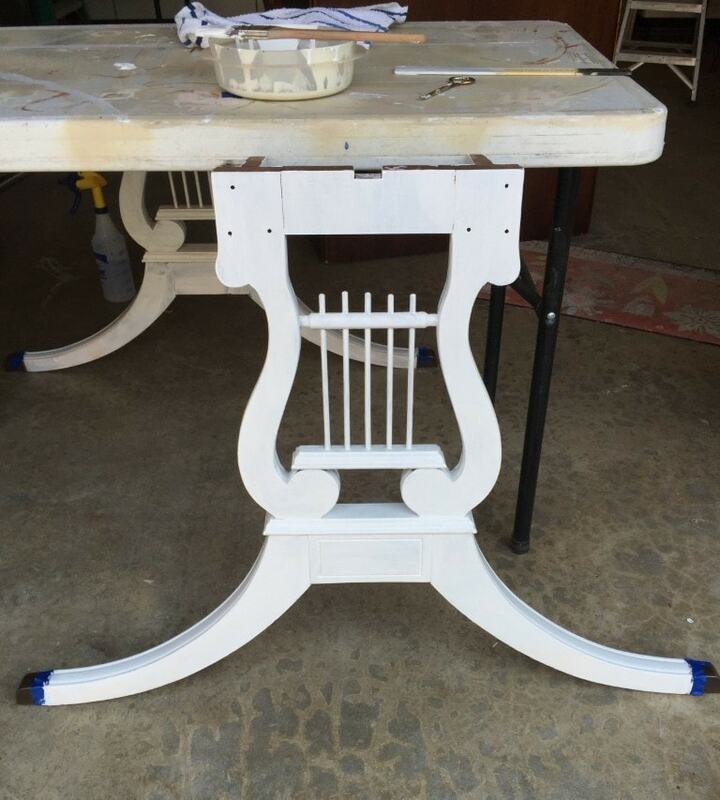 of course…but decided pretty early on that I would just refinish the top of the table. This was not the first time I had refinished something so I knew it was going to be a process, but I was up for the task. Fortunately, this Arizona girl was now blessed with a beautiful Seattle summer to spend her days in the garage with the door up feeling the cool breezes and the occasional rain. Did I mention I love Seattle? 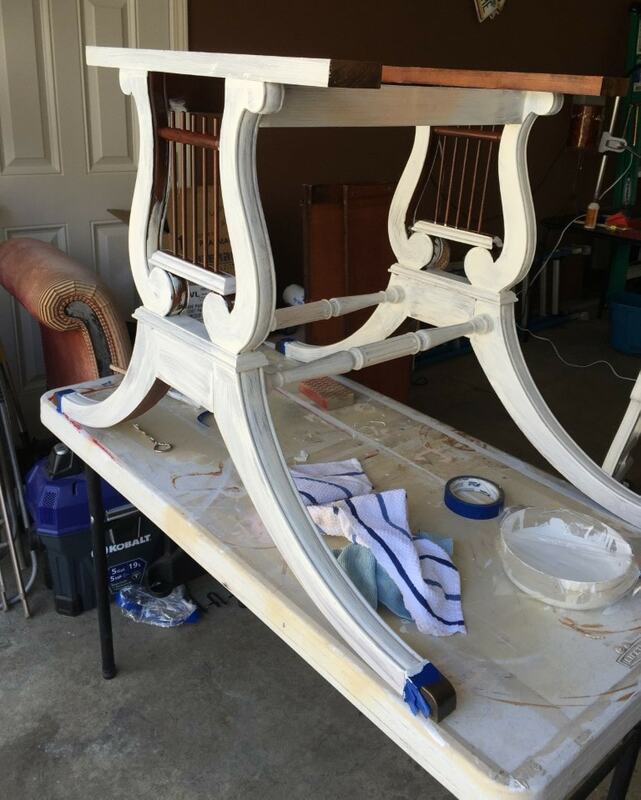 chalk paint or “regular’ paint? 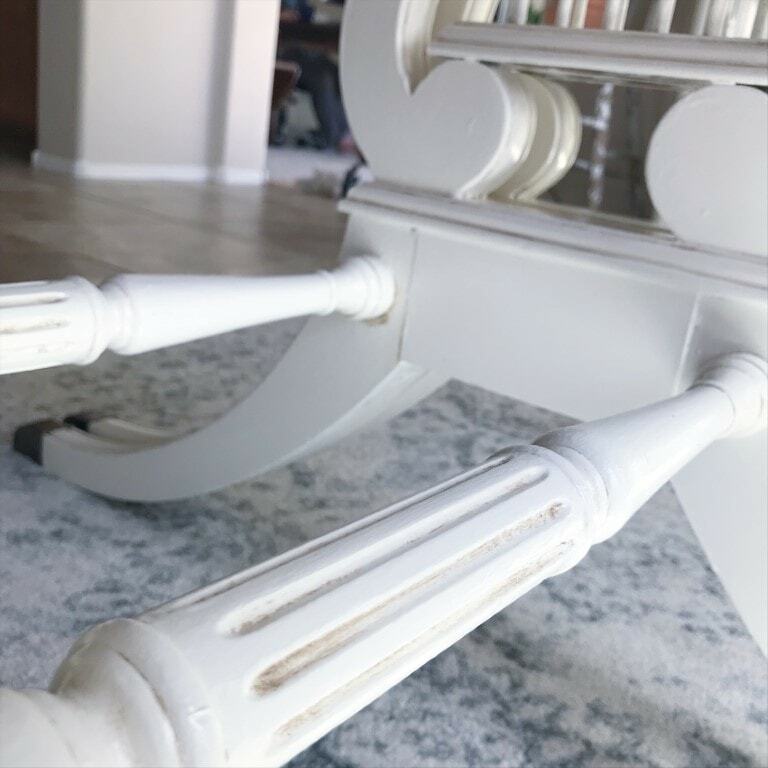 I love chalk paint… I do… but I decided to try something different that promised to be super durable with a hard finish and even self-leveling. Not that I mind brush strokes at all because I actually love them. So…I settled on Sherwin Williams Door and Trim Paint and I am so glad I did! Due to the fact that it’s not chalk paint, I decided to do a bit of sanding…just to rough it up, followed by a coat of primer. I used Kilz primer because I had it on hand and I know it’s good stuff. 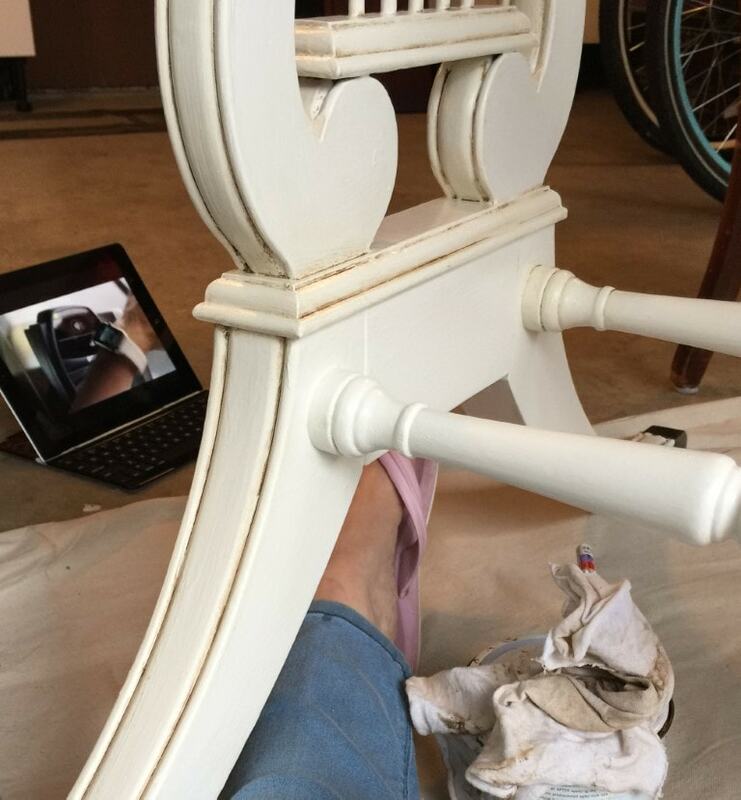 Using a Purdy brush…my favorite…I applied two coats of SW Door and Trim paint in Dover White (heads up…this is the exact paint and color I will be painting my kitchen cabinets with very soon…stay tuned). The self-leveling aspect of this paint is pretty darn cool. It goes on so smooth and silky…I love it! Sanded and in the Priming Process! Getting closer! Painting those little spindles is no walk in the park! Time to wax those legs! on my painted furniture, but since I didn’t use chalk paint I knew it would be difficult to distress by sanding so I decided to try something else. Annie Sloan dark wax in all the details/cracks/crevices. I used a wax brush to apply it and then wiped it with a cloth being careful not to completely remove it from the detail areas. I knew once it cured it would be there to stay and I love the aged look that it gave it. Annie Sloan dark wax for an aged, distressed look. I love the brass ‘not real brass’ feet so I polished them up and made them shine using my trusty Norwex cleaning paste. I love this stuff! which was a completely different process. The top was in pretty bad shape with water damage and scratches (as you can see in the first before photo). which meant I had to get all of the finish off first. I applied a thick coat of Citristrip Paint and Varnish Stripping Gel and then covered it with plastic. I wish I had a picture of that part but alas…I don’t. Just imagine cutting down the seam line of big trash bags and laying them out on the top of the Citristrip on the table top. This way it stays nice and moist and seems to make it work even better. I love this stripper because it can be used indoors and doesn’t have a strong smell or bad fumes, not to mention it works like magic. 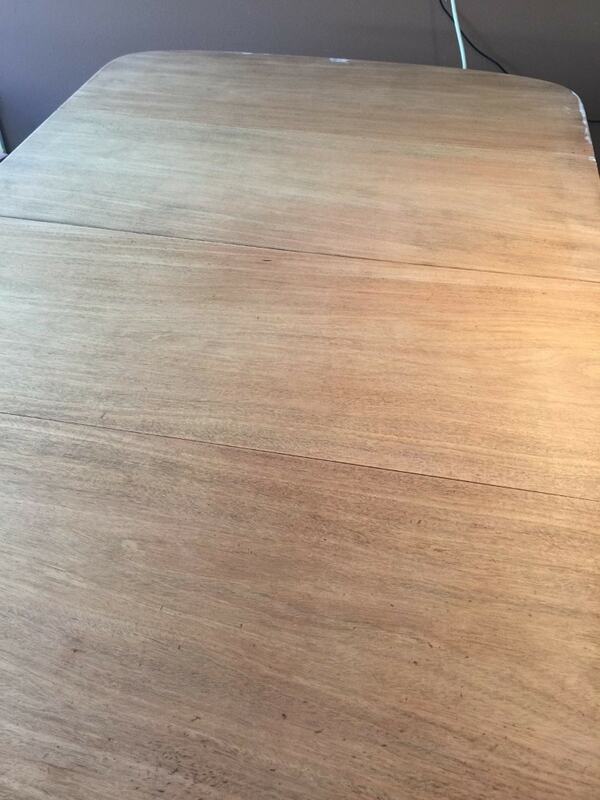 Table top is stripped, sanded, and ready for stain! but I still sanded the heck out of that table top to get all the scratches out. There were a few places along the edge that had some issues so I used wood filler on those and then I was ready to stain. 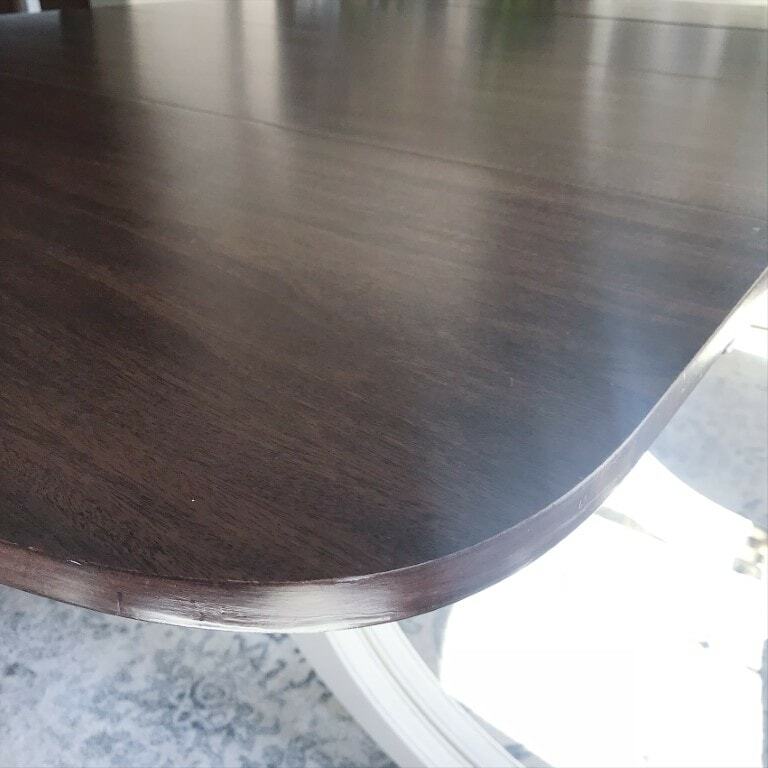 I chose MINWAX Wood Finish Penetrating Stain in Dark Walnut. Staining is quite fun, wipe it on and wipe it off. 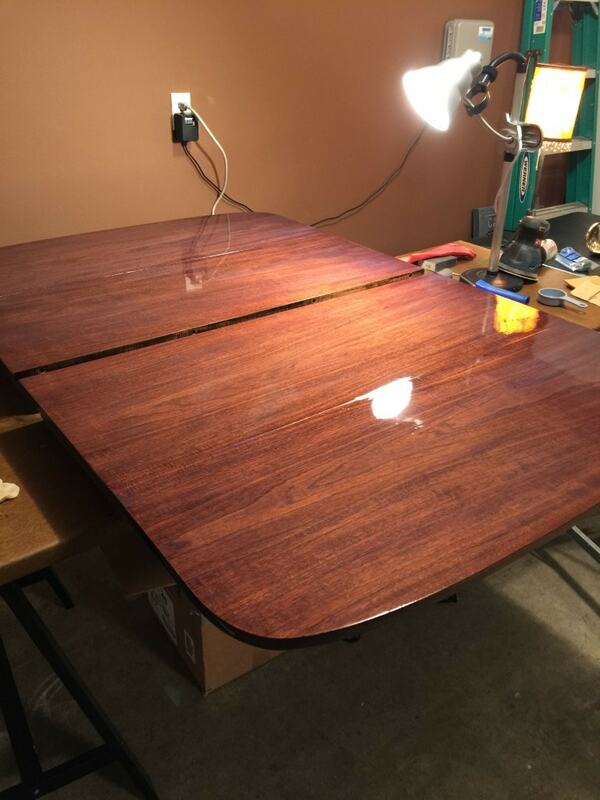 I put two coats on the table top and then was pretty happy with the color. I followed the directions on the can very carefully and even let it dry a bit longer than it needed since it was cool and rainy. I was ready to apply the top coat. I chose MINWAX polycrylic because I was promised that it was tough and would not yellow over time. This part of the process is not for sissies and it’s very important to Lather, Rinse, Repeat…or in other words (literally) Apply, Sand, Apply. Now it seems almost counterintuitive to apply it…let it dry…and then sand it off, but trust me, it works. 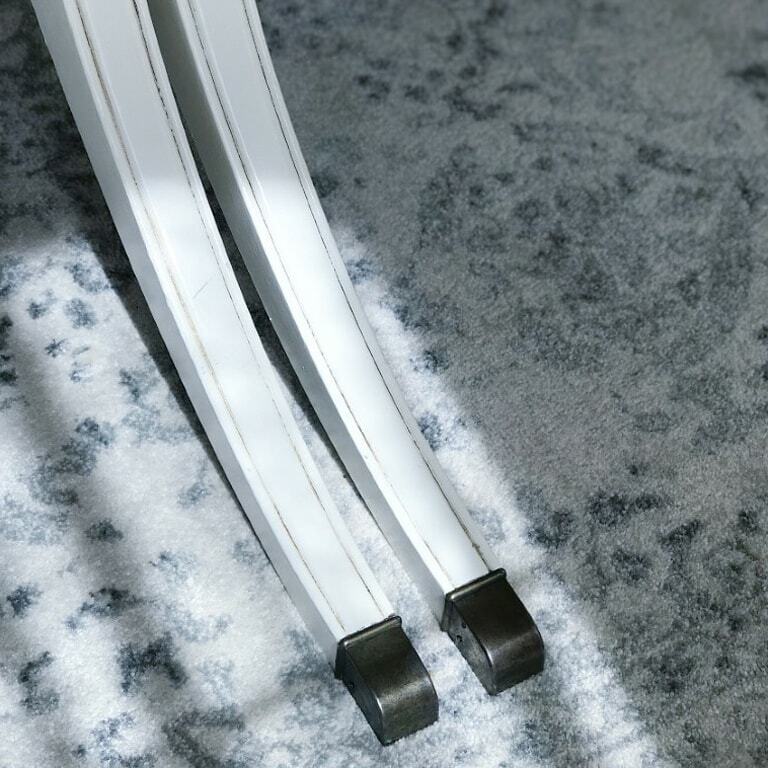 This process gives you a beautiful, smooth, polished surface. I applied 4 coats of top coat. After 4 coats of Polycrylic! So shiny!!! Don’t worry about the slight milky look to it…it dries crystal clear. Since this was going to be our everyday dining room table…and our only table…I decided to let it dry for 7 full days. I wanted to make sure not to use it too soon and risk messing up all my hard work. 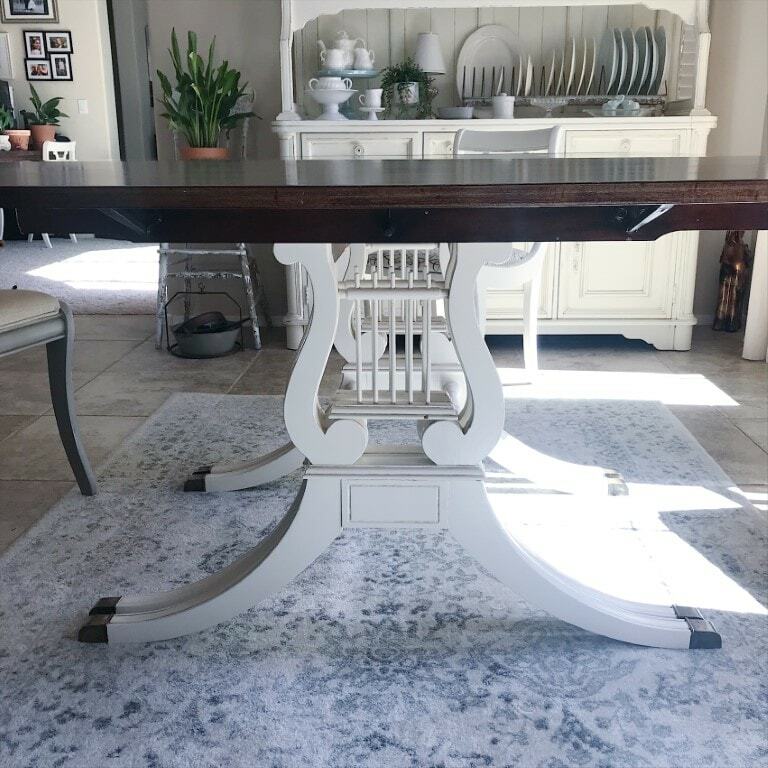 When the drying period was over and the table was back together and in our dining room I was thrilled with how beautiful it was and quite proud of myself. I mean, come on, look how pretty, Right?? What a transformation! So Pretty!!!! 3 years later and only a few minor scuffs. 3 years and still shiny! 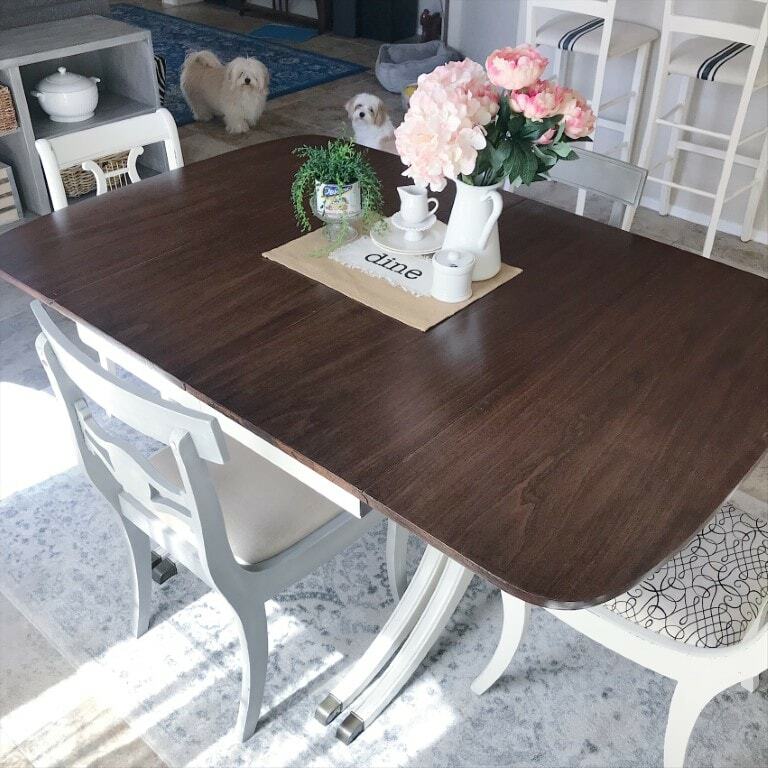 Dining Room Table Makeover after 3 years! I am so happy with my choice of products. It even survived the move back to Phoenix which meant being disassembled, packed into the back of a moving truck, taken on a long road trip and then, to top it all off, stored in the heat for 2 months while we bought a house. 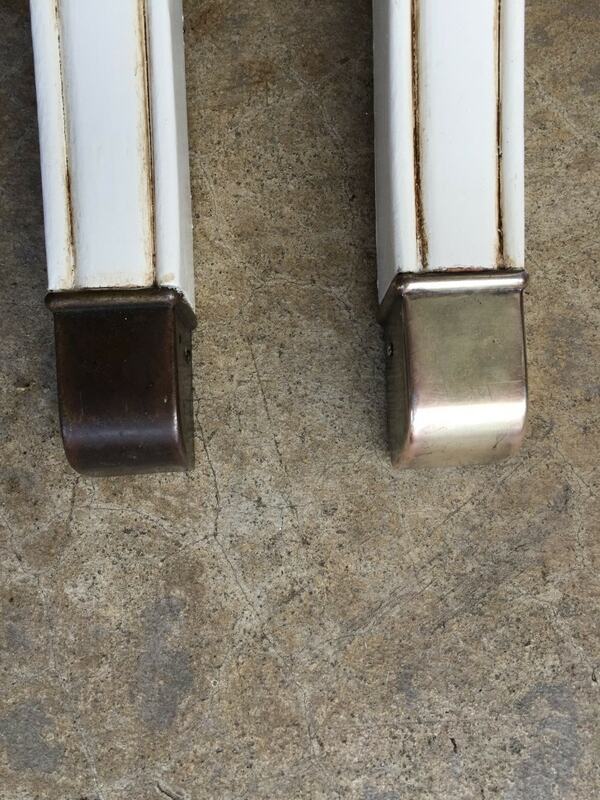 It has some scuff marks from feet resting on it and chairs bumping against it but the paint has not chipped at all! 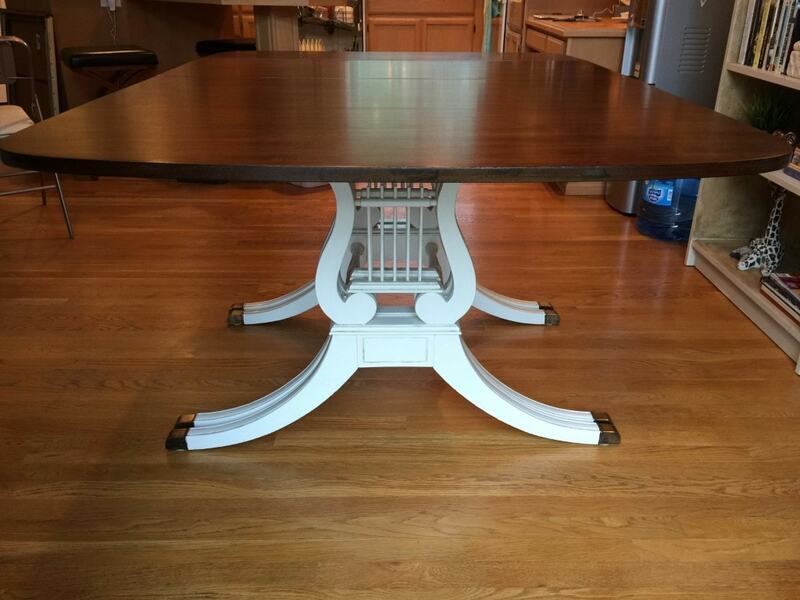 I consider this project a Dining Room Table Makeover WIN!! !